Find visitor parking on UTA's campus. Where May I Park with my Permit? All 2018-2019 men's home basketball games and mens/women's double header home games will be paid parking in the College Park garages starting an hour and half before tip-off. 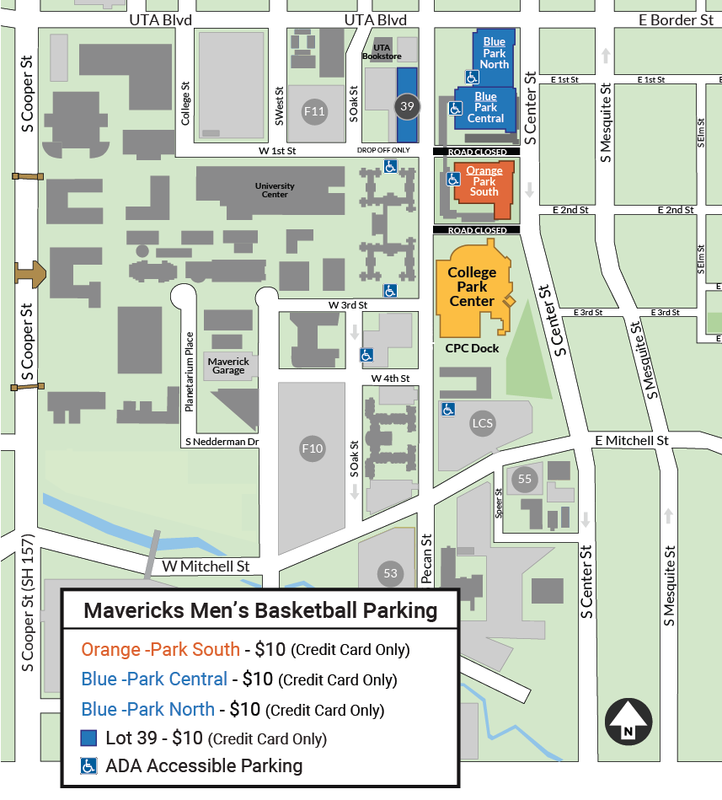 Premium parking in the orange College Park South garage is $10 ($8 prepaid online) and Select parking is $10 (no prepaid available) in the blue College Park Central and South garages and Lot 39. Credit/Debit cards are accepted at all locations. Cash is only accepted in the Orange Park South garage. Maverick Club members may purchase a DISCOUNTED Premium season ticket pass by contacting Danielle Sanders (danielle.sanders@uta.edu, 817-272-0694) or Alex Ware (alex.ware@uta.edu, 817-272-9613). No free game day parking is available on game nights. Current UTA permit holders can park in event lots including College Park North, Central, South, or other surface lots without paying to park. License Plate Recognition (LPR) will be used to ensure an active permit is attached to the vehicle prior to entering the lot. © 2019 The University of Texas at Arlington.